Home » Assam Govt. Jobs » KKHSOU Recruitment 2017, Associate Professor, Grade IV, Senior Assistant etc. 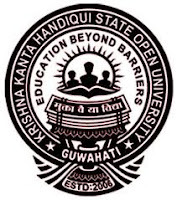 KKHSOU Recruitment 2017, Associate Professor, Grade IV, Senior Assistant etc. Grade IV- ST(H) – Two posts. The form of application with details of required qualification, scale of pay, age limit etc. can be downloaded from the website of the university www.kkhsou.in. The application should be accompanied by a bank draft of Rs.500/- in favour of KKHSOU to be drawn at Guwahati. Last Date: 23rd November, 2017.